Have we mentioned how stoked for winter we are this year? You read that right. While most people are chasing a neverending summer we want to be where the snow falls in plenty. 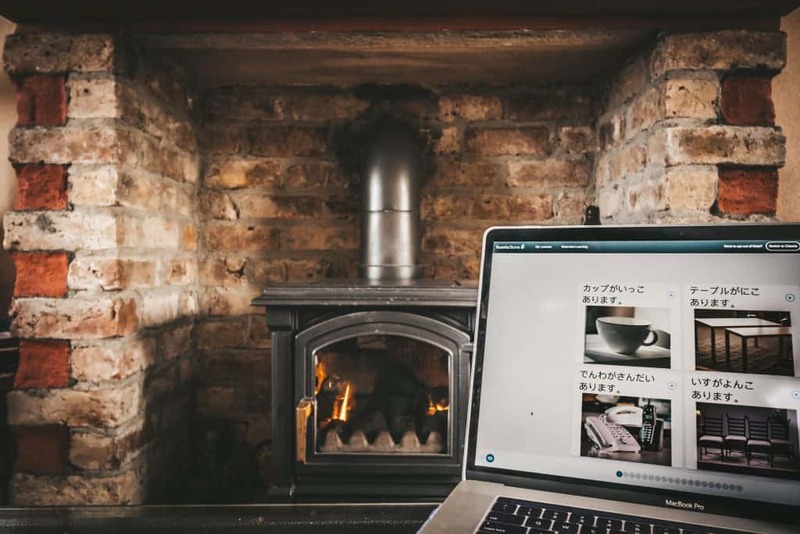 We’ve been planning our winter in Japan for months now and we’re determined to learn Japanese. For the winter of 2018/2019, we’ll be based on the Northern Island of Hokkaido at the ski resort of Niseko. It’s more or less known as the powder mecca of the world. We love to snowboard and for the next several months we’ll be exploring the mountains and beauty around this Japanese island. 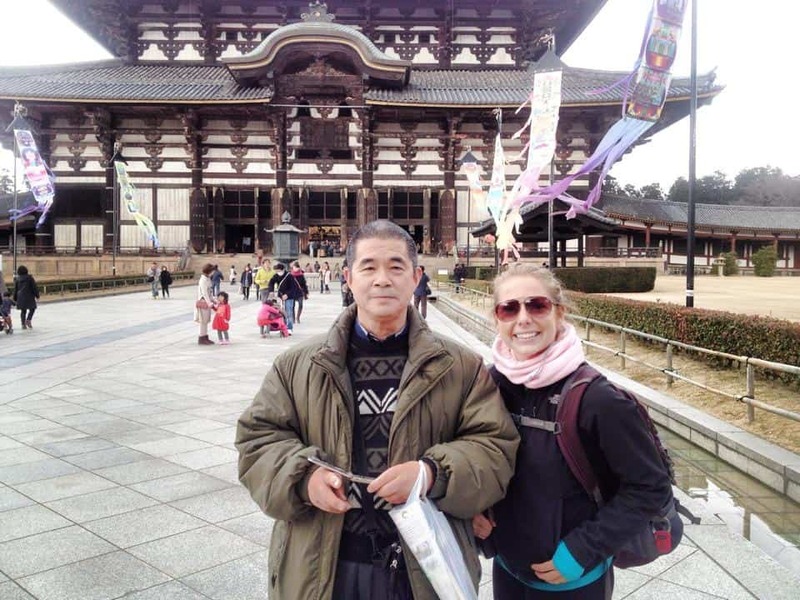 We’ve both long had a fascination with Japanese culture and it has been on the top of our travel bucket list. Natasha crossed it off her list in 2014 and has been itching to return ever since then. The goal this time is to explore more of Japan by understanding the language in a country known for its difficulty. With an opportunity to finally immerse ourselves in another culture and learn a language we’re excited to finally learn a second language. We’re ready for the season with a bunch of fresh gear and a full course on Japanese with Rosetta Stone. 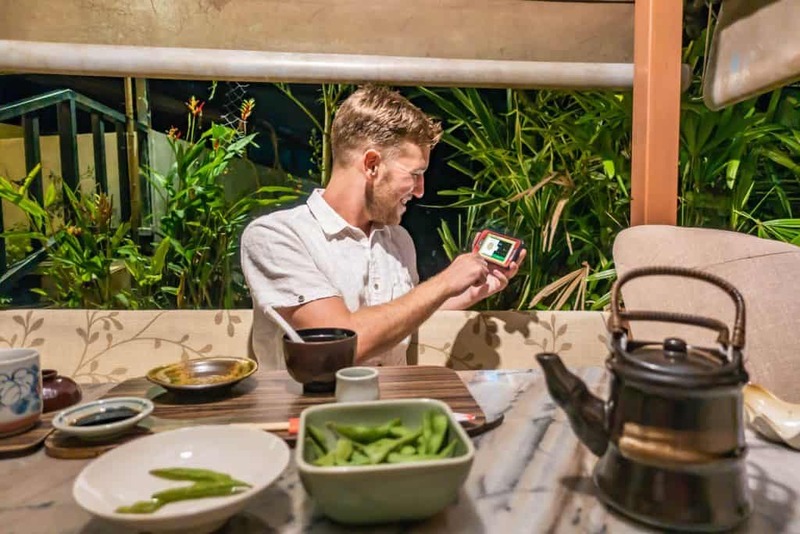 We’ve heard of several language learning applications but went with Rosetta Stone as they have a big name and we’ve heard multiple success stories. So we are prepared to see how we carry on learning Japanese. One of Natasha’s travel buddies in Japan. They couldn’t understand eachother, but had a great time anyway. This is one of the first language learning tools we ever heard of back when they released software to teach users via computers. Even Natasha’s college Spanish class was taught on Rosetta Stone. As time has evolved the software has become more robust transitioning from a physical CD product to a cloud based app accessible via desktop and their mobile app. They have up to 30 languages for English speakers to learn a new language online, and 23 on their mobile app. The company is the most well-known language learning software and has been used by schools, companies, and travelers for decades. Rosetta Stone uses a different approach to learn a language than a traditional course or school. There are no textbooks or vocabulary words. Instead, you take lessons and learn through context with what they call their immersion method. The program is available on a subscription basis with the option for 3, 6, 12, and 24 month subscription. You start the course and learn by listening and selection picture with audio. It’s great because it allows you to hear the proper pronunciation of words and then you can repeat words. We found this to be super helpful when it comes to learning Japanese as the phonetics are much different than English. The course also helps you memorize the new words through repetition in the course and reading the audio aloud. As you progress you also begin to learn the written language, a difficult task with Japanese. We were really impressed with the way in which you learn grammar through repetition, with key elements of the sentence highlighted and enforced through repetition. Online students can even take advantage of live tutoring with a native speaker. A great opportunity to practice dictation and conversation in real life, because not everyone can travel full time. We love this feature in regards to learning Japanese where we often have a tough time with words. The difficulty with many languages in Asia for us is the use of a different alphabet and totally foreign symbols. Unlike German or French, they do not use the Latin alphabet with makes things very difficult at times to read.Rosetta Stone offers the ability to toggle between alphabets and symbols. What makes Japanese particularly challenging is the use of different scripts and syllabary. Once we were able to look at the way it was spelled with Latin characters it clicked in our brains. I’ve been progressing through Japanese in a series of units and feeling more comfortable with the language. Only a few units in and I already look forward to traveling around Japan this winter. I can order food comfortably, ask for directions, and cover the most basic travel needs. The Phrasebook feature is also super helpful, as it has commonly used phrases for every situation, so if your brain freezes, you can just search for what you’re trying to say. It all feels a lot more like a game than it does a course and it’s refreshing. With each and every course I get more excited knowing I’m going to be able to put this all to the test in a couple months. We’ve never been able to travel and say more than the basics (hello, thank you, goodbye), so this is a new milestone in all of our years of travel. While being fluent is a long road away after completing several units I feel that it is, in fact, possible with time. When Tasha I get to Japan later this year we’ll continue with the course and full immersion with the hope to finally be fluent in a second language. As with almost all American students we took language courses in both high school and university. However, the structure of the classes left us learning enough to pass a test but never making large steps in actually learning a language. Before everyone exam, you’d cram all the vocab words, pass the test, and then forget most of what was on the test. It all felt too rigid and disconnected from the language. We like online learning courses like Rosetta Stone as it allows us to structure the course how we see fit. 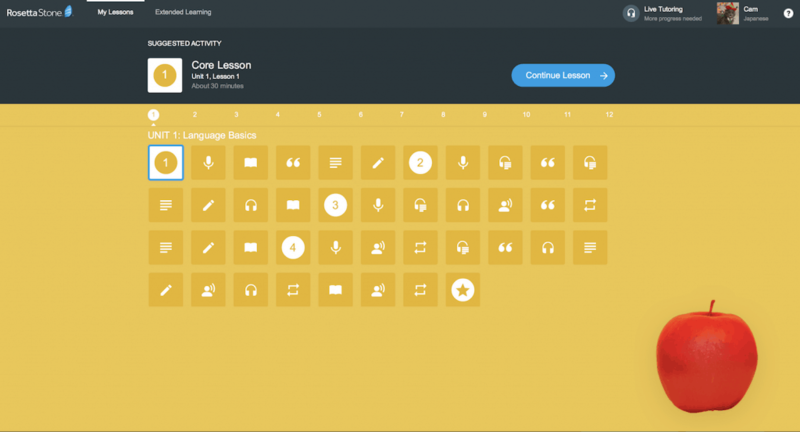 There are a number of key features that I particularly like about Rosetta Stone beside the course structure. I like that with an online course you can take lessons on both your phone and desktop while the progress is tracked. This is a great strength for us as we’re frequent travelers and don’t always have a set time to take a course. Another great feature that we love is that you can download courses via mobile and save them to work offline. This was very helpful while we recently stayed at an eco beach resort in Indonesia with no wifi or phone signal. The only other language learning app we’ve used is Duolingo. I took several courses in both German and French, the two languages I took in high school and university. I was able to breeze through the beginnings of the courses but eventually found myself converting the language to English, rarely heard it spoken, and had a tougher time completing units. However, when compared to Rosetta Stone, we feel that if you want to truly learn a language, it’s worth paying for Rosetta Stone as it is a quality program and feels more apt to education. As of now, the one thing we can be certain of with Rosetta Stone is that it greatly helps with our proficiency in learning a new language. When I started the course I literally knew three words in Japanese – Konichiwa, hai, and arigatō (hello, yes, and thanks). So, to be able to speak in full, albeit basic sentences, is a great improvement. I’m still a long ways away from being fluent in Japanese. However, with any course, it will only provide a command of the basics not quite conversational. The next step would be to immerse yourself in the language and practice in real life with native speakers. It’s tough to learn the intricacies of a language without having real-life conversations with native speakers. Rosetta Stone is a good service for travelers, particularly for those looking to take long trips to countries. The course is a great way to prepare, learn a new skill, and get excited about an upcoming trip. I personally can’t wait for Japan and it’s not just because we’ll be doing my favorite hobby every day, but because I can finally check a bucket list item off my personal list (learning a language). 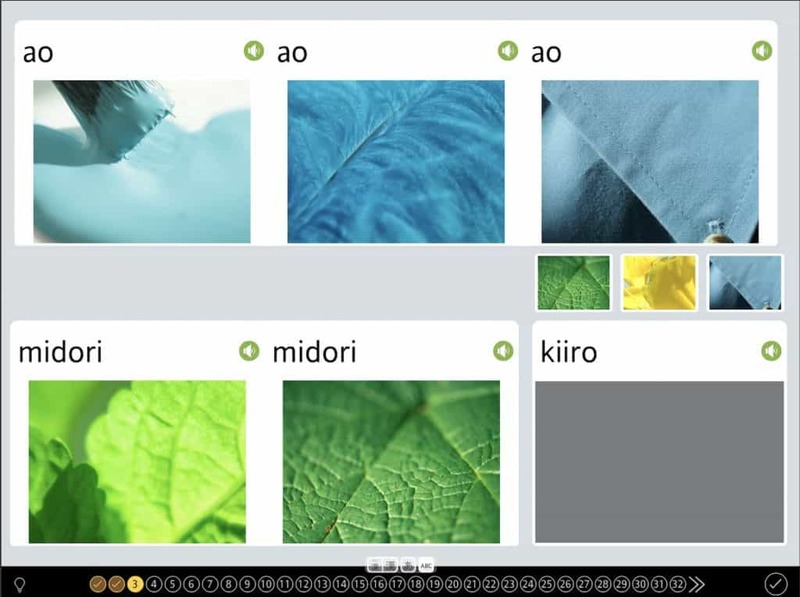 The goal over the next two months is to continue with our Rosetta Stone course until completion as we move to Japan. We’ll be in the country for at least five months and if we like the region may stay on for another year. I feel confident that Rosetta Stone is a great tool for learning the foundations of any new language. 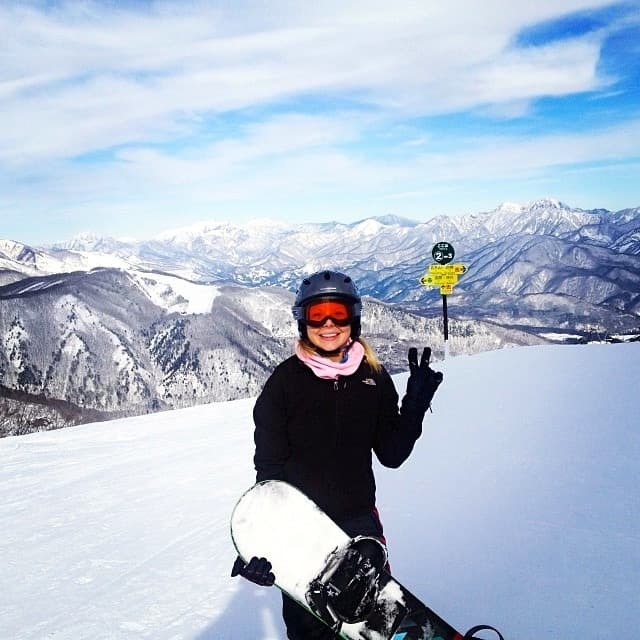 Snowboarding in Japan in 2014! See you again soon! All the reasons we love Japan!